Dimitar Berbatov was nothing less than vicious,and relentless as he scored hatrick to become the lead pulveriser for Manchester United to crush the minnows Birmigham City. The instrumental Berbatov by this scored his third hatrick of the season, keeping his sublime run on the go and also the highest scorer in the Premier League with 17 goals. Berbatov has into action early in the game as he went on to nod on in the 2nd minute into play. The others to make their mark was the veteran Giggs and Nani hence sealing a miserable loss for the Birmingham, leading United to a lossless tournament so far. Birmingham City, on the other side were bidding to claim their first win since 1978 , which in result came out to be miserable on their part. 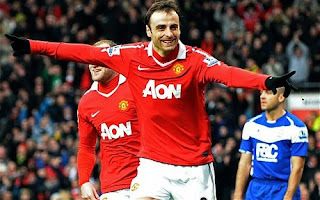 Goals kept on coming for the Red Devils like flowing river , as Berbatov struck again in the 32 minute. Later in the half time stoppage the Welsh Ryan Giggs also made his mark. On the start of the second half, again United remained attacking, and made absolutely no room for Birmingham to find their way around. They had a total of 1 shot on goal in the entire 90 minutes. Berbatov finally successful to convert one in the 54th minute for the United. Nani's fifth and final goal in the 77th minute summed up Birmingham's state of mind as he skipped across the face of a heavy-footed defence to slam a powerful shot past Foster into the corner of the net from 15 yards.